The bright green emerald is the elegant stone for those born in May. Emerald is the only stone, besides topaz, that is listed in the ancient birthstone tables. It is suggested as an anniversary gift for the 20th and 35th anniversaries. According to folklore, the emerald was used to improve memory, intelligence, and help wearers predict the future. 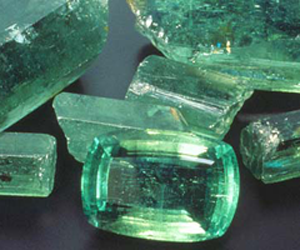 Emeralds have been mined in Egypt since antiquity and India and Austria since the 14th century.